Rollins Auto Wrecking provides used auto parts for vehicle owners throughout the Tacoma, Washington areas. Our unique and functional services allow car owners to receive used auto parts that can have their vehicles back in working order especially after a breakdown or other vehicular emergency. We offer a wide selection of scrap metal pieces for virtually every make and model of car, van, truck or SUV. Regardless of the type of car that you have, we have the parts that are right for your car. 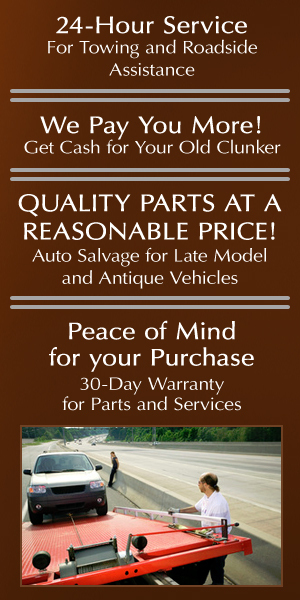 Rollins Auto Wrecking offers quality auto parts at very affordable prices. We have been providing this service for decades and being in business since 1939, we have helped thousands of customers receive quality parts for their cars at bargain prices. All of our metal prices are significantly lower than that of other auto manufacturing companies and we take pride in being able to provide this excellent value to our customers. If you are in need of scrap metal or car parts, you can depend of Rollins Auto wrecking for all of your used car part needs. In addition to providing affordable scrap metal prices and used car parts, Rollins Auto Wrecking also purchases junk cars at very competitive prices. If you have been meaning to get rid of your older, unneeded vehicles, you can depend on us to offer you a good price guarantee. At Rollins Auto Wrecking, we provide the best value and quality materials. Call us today 253-846-9393.